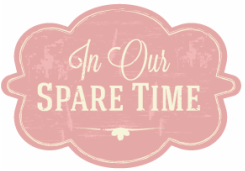 So do you have an awesome antique dresser, maybe a family heirloom that you love but those dang watermarks and beat up looking wooden tops are holding you back from displaying this little gem in your home ? Well we are here to help! 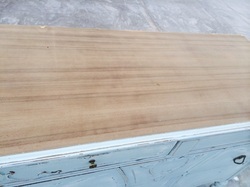 We are about to give you the 411 on restaining the tops of wooden dressers. OK, so there is a little bit of paint on this too... from painting the dresser but are we worried?? No way! We know we can sand this baby down and she will be looking great in no time. 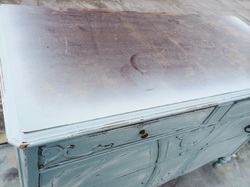 If you are planning to paint the dresser and keep the wooden top (one of our favorite looks) we recommend painting, distressing, glazing and sealing the main part completely before you start on the top. That way when the dust starts flying, the majority of your dresser is already done and can easily be dusted off. Orbital sanders are what we prefer to use. More power and less painful muscles at the end of the day. It is worth the $25.00 investment for sure. We keep three different grits of sand paper on hand. 60 grit for super glossy or gummy surfaces that are hard to sand. 150 for medium smooth surfaces that need lighter sanding and 220 for the final smoothing in preparation for stain. In most cases, we use all three starting with the 60 grit. You need to sand down to the raw wood. It is usually further than you think. Do not leave any shine or discolored wood, otherwise the wood will not accept the stain evenly and you will be soo frustrated! It takes a lot to re sand all the fresh stain out of the wood if it is not even so make sure it is raw wood before you stain! This is what it should look like when sanded down properly. Even, non-shiny and smooth. You can't wait to stain! wait........ Be sure and wipe any and all dust away at this point. 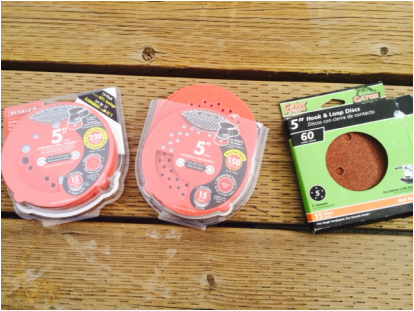 You do not want any dust to mix in with the stain and finish, your prep work is so important! Pick the color you would like your wood to be stained. 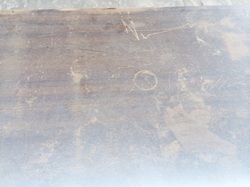 This piece is being stained in DARK WALNUT. You will want to wear a glove and get a soft clean cloth, free of lint. It is very hard to get stain off your fingers and it spreads everywhere! 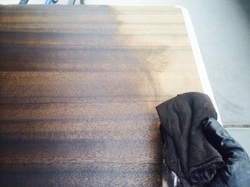 Apply a generous amount of stain to your cloth and start wiping in the same direction as the wood grain. Follow the directions on your stain to find out the drying times. You will want to wipe off any excess with a clean soft cloth so the surface is uniform. Let dry completely in between coats. Apply stain until you reach the color you like. 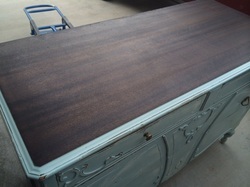 This is a picture of the top after the second coat of stain. Perfect! Let it dry completely and get ready for some shine! You will want to get a good quality brush. 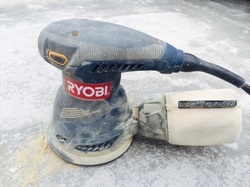 A brush made for finishing work. Smooth without bushy bristles. You want this to glide on like butter. Brush with the grain of the wood once a gain. 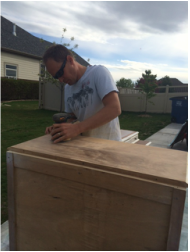 Be sure when using Polyurethane that the piece you put it on has not been sitting in the sun. It needs a cooler surface for it to spread evenly and not get gummy on you. I made this mistake on our kitchen table years ago. It is hard to fix when it gets gummy. Apply a good amount to the brush, you don't want it to be too dry. This product does a great job of leveling out on the surface. *TIP*once first coat is applied, get down eye level with the top of the surface just applied and make sure you do not see any dry spots and that the brush strokes are uniform. Be sure to wipe off the edges of the furniture in case there are any drips. Follow the dry time recommended on the container. Once completely dry, you can take 600-1500 grit automotive sand paper and hand sand it lightly to make it very smooth. Be sure to wipe off sanding dust well before applying second coat. Continue to apply as many coats as you like, making sure you dry and sand in between each coat. It will look so glossy and beautiful. It will also continue to get smoother every coat.